Since May 31, the world is talking climate change, I am happy to say. Most of the message is angry and scornful of the Trump Administration’s plan to exit the Paris Climate Change Accord. President Trump has rejected the United States’ leadership role in preventing climate disaster in favor of continued profits for the oil, gas and coal industries. That act was the crowning blow in his battle against environmental responsibility. The offensive has included the appointment of oil well huggers Scott Pruitt, Rick Perry, Ryan Zinke and Rex Tillerson; executive orders that reopened federal lands to mining and drilling; budgetary gutting of the EPA and all other renewable energy programs: and suspension of the Clean Power Plan to cut emissions from U.S. power plants. Trump’s ultimately leaving the Climate Change Treaty was not unexpected, but it was foolish. The biggest issue of course is its damage to the planet. A Washington consultancy, the Climate Advisors, predicts that Trump’s climate policy will cause U.S. greenhouse gas emissions, which have been falling, to begin to flatten or increase by 2020, and to inject an extra half-billion tons of CO2 into the atmosphere by 2025. Global warming will increase, leading tomore killer heat waves, superstorms, drought, crop failure, melting ice and rising seas. But there is mounting worldwide recognition of the economic and public health advantages to a rapid transition to conservation and renewable energy. Industrial and job growth is booming in the field of solar and wind energy. The U.S. not only will be stigmatized by its immoral stand towards the world’s climate future, it simply will not be able to compete in a rapidly changing world. Recognizing the danger and the opportunity, local and state leaders are filling the vacuum left by the federal government. As of this writing, more than 350 mayors representing 65.8 million Americans in 44 states have signed on to the “Climate Mayors” coalition. Springfield’s Mayor Domenic Sarno was one of them. Thirteen states, including Massachusetts, have joined the pledge to Paris. The twelve are home to a third of Americans. Gov. Jerry Brown of California has met with Chinese leadership to consider ways to work together to develop and adopt renewable energy technology. China has replaced the U.S. in the clean energy arena and California leads U.S. states in its climate goals and controls. Trump’s ignorance and greed on behalf of the fossil fuel industry may have sparked a new awareness among those who are paying attention: this is a fight that must be fought from the grassroots. Our federal government, at least for now, is firmly backing the other side. In Massachusetts, there is a raft of initiatives on the legislative agenda that would catapult our state into the forefront of the battle against climate change. An environmental coalition is backing plans to achieve electricity powered by 100 percent renewable energy by 2035 and siting green jobs in high-unemployment communities like Springfield. There are also strong bills in Boston for carbon pollution pricing, grid up-grades, electric vehicles, and countless other conservation measures. It is up to us to make sure that our legislators know that we are not fooled by Trump, that we support conservation and renewable energy and we expect the same from them. Call them. Unfortunately, parts of the present Massachusetts budget run contrary to the direction we must take. The budget shortfall has hit the Pioneer Valley Transit Authority, which is threatening to cut back on and eliminate routes that are necessary to those who don’t have or don’t want to use cars. I only found out because I ride two of those buses, the P21 Express and the B48, to Springfield to my job. This is a climate justice issue. Low income people will be hit particularly hard, losing their means of commuting, shopping, caring for family members. On the other hand, we are a society that must begin to abandon our cars in favor of less fuel-burning alternatives. Public transit must be expanded, not contracted. The PVTA does not have nearly the number or frequency of routes to be easily usable by most people. Public buses are necessary to fight climate change and support economic equity. There have been several hearings about the bus route eliminations, with round denunciations of the cuts. Check out the proposed changes and send your opinions at http://www.pvta.com/info4.php. This is a chance to think globally and act locally. Marty Nathan is a physician at Baystate Brightwood Health Center in Springfield and lives in Northampton. I’m writing this from a near-horizontal position on my living room couch, resting my elderly bones after a good march from the Federal Building to the Springfield City Council steps on Saturday. It was a sister event to the 200,000-strong People’s Climate March in Washington, D.C., one of hundreds around the country. My husband and I joined 1,200 others in Springfield, and were struck by a tone and integrity different from past such rallies. 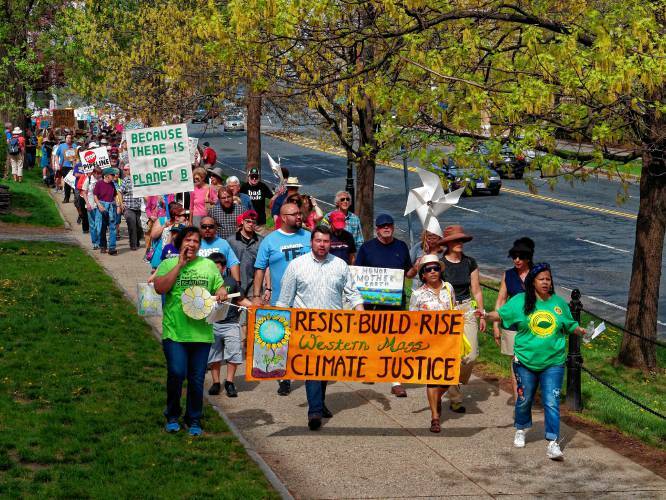 What distinguished the Springfield March for Climate, Jobs and Justice? First, it was bigger. As an organizer, I have known the frustration of encouraging people to show up to make the needed case. Political activity is not on most people’s front burner. Jobs (often more than one) kids, housework — the immediate — need to be taken care of before dealing with climate change, war, or immigration. Too, there is a feeling of powerlessness in the face of government and corporate policy, and some anxiety about the kickback of taking a public stand. Most people may have strong feelings about the headlines but encounter a certain embarrassment at the thought of marching holding a sign and repeating “The people united will never be defeated!” I get it. But the Trump era has changed a lot of things. His and his administration’s brutal racism and sexism, his open embrace of the wealthiest at the expense of public interest, his ignorance and willingness to endorse the most cockamamy excuses for his actions have both frightened and emboldened people. And once they have been out in the streets, the empowerment, existential meaning and social connection are a welcome alternative to despair and a stiff drink. Second, it was broader. On April 29, we marched for climate justice, the concept that we can and we must reverse the deep-seated inequity of our society even as we fight against climate change. In my many years as a political activist, I have found that often people’s personal and cultural needs have interfered with our ability to get along. Environmentalism has been viewed as a “white thing.” White people don’t show up for Black Lives Matter or immigration rights events. Racism, sexism, genderism and just plain individual needs have divided folks who should have been supporting each other around issues of human rights and a sustainable world. But again, Trumpism has made us examine our priorities. Although the majority of marchers were white folks, Springfield’s diverse neighborhoods and unions were well represented and had skin in the game. Hip hop artist Tem Blessed gave the most sophisticated analysis of the intertwining of our social problems and environmental destruction, blending his experiences as a young victim of police brutality with his longing for a sustainable world. The march endorsed the May Day immigrant workers strike and the rights of women to equal pay for equal work. It was a good step forward and I am deeply grateful to all who came out and made the long march. Those who went to D.C. get special respect for having borne the hottest April 29 in recorded history. We still have jobs, kids and homes to attend to, but we thoughtfully chose to sacrifice a day for more intangible but absolutely necessary ideals. Two recent studies point out both the dangers of our not acting on climate justice and the benefits of confronting it. A January study by Ray Bradley of UMass found that New England will warm faster than all other parts of the country except Alaska and will reach a 2-degree Centigrade rise by 2025. Snow will become a relatively rare commodity and wintertime rain and flooding will prevail. It confirms previous studies that indicated Boston’s sea level will rise higher than previously predicted: 10 feet by 2100, causing flooding in 30 percent of the area. On the other hand, researchers from the Harvard School of Public Health last week published research on the impacts of putting a fee on all gas, oil and coal coming into the state, what is called a “carbon fee.” They found that the implementation of either of the two bills before the Massachusetts Legislature now, S.1821 (An Act Combating Climate Change), and H.1726 (An Act to Promote Green Infrastructure, Reduce Greenhouse Gas Emissions, and Create Jobs), would result in 349 lives and $2 billion in health benefits saved in Massachusetts from 2017 through 2040. The decrease in pollution that would occur as we combat climate change would also reduce asthma, heart attacks and stroke. The flooding, extreme heat and pollution-related disease always have weighed heavier on poor and low-wage working communities, particularly those of color. Precarious housing, lack of transportation and air conditioning, and increased direct exposure to pollutants in these communities make them particularly vulnerable to the ravages of bad air and climate change, though they have contributed the least to the problem. The climate justice movement has always made sense. The lives most at risk are the lives already weighed down by economic stress and racism. We in the climate movement are finally beginning to get it. And act on it. Marty Nathan, MD, is a mother and grandmother who lives in Northampton and works at Baystate Brightwood Health Center in Springfield’s North End. She is a steering committee member of Climate Action NOW. 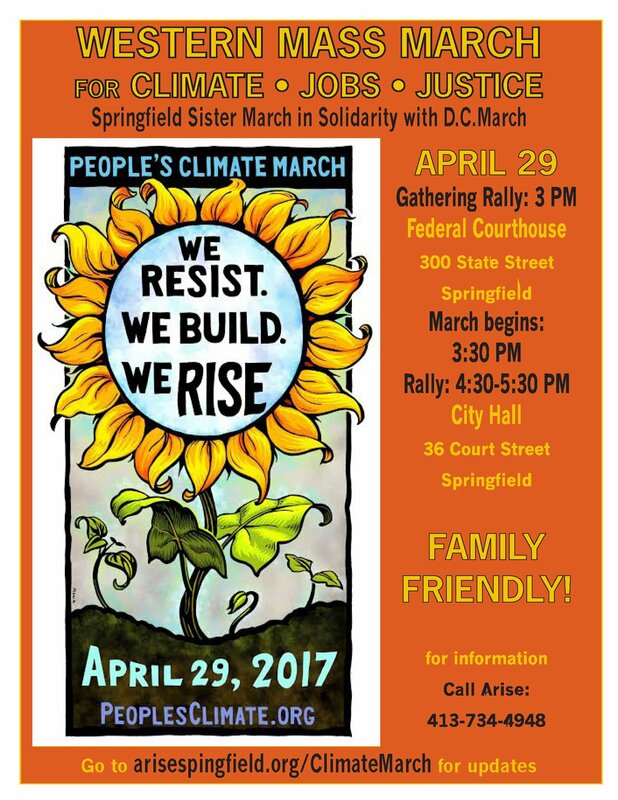 Would you like to help with the April 29 Western Mass Climate Justice March? * Please spread the word about the march, invite people, and make solid plans to show up with your friends and family on this important day. — Click HERE for the march webpage. — Click HERE for the facebook event. * If you are on facebook, please share the event and rsvp/going to the event. * Financial – a march like this comes with expenses such as port-a-johns and staging. If you would like to contribute, you can use paypal or a check. In Springfield, environmental racism has been threatening one of humanity’s basic rights for years – the right to breathe. 1 in 5 people in the city have asthma, a rate that sharply increases for children and people of color.1 “We have to stop taking the air we breathe for granted,” shared Michaelann Bewsee, founder and organizer of Arise for Social Justice. 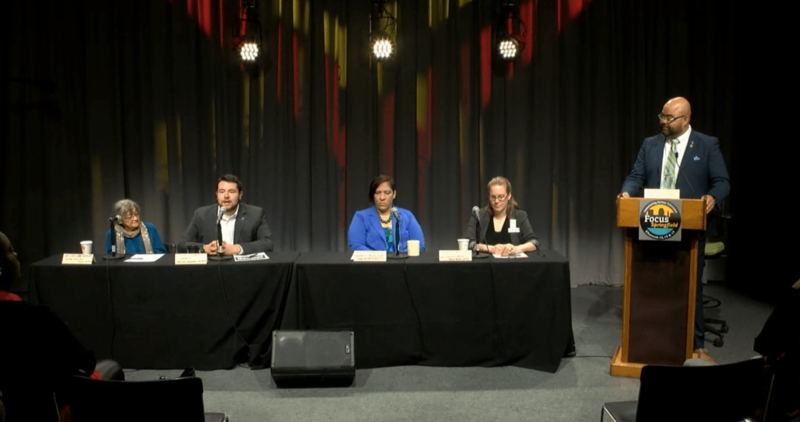 To highlight this issue, the Springfield Climate Justice Coalition (SCJC) recently organized a panel filmed live on Focus Springfield Community TV, bringing together representatives of local and statewide organizations working towards environmental and climate justice. The panel, hosted by Springfield Ward 1 City Councilor Adam Gomez, featured Michaelann Bewsee of Arise, as well as Claire Miller, community organizer at Toxics Action Center, Ivette Hernandez from Keep Springfield Beautiful, and Jesse Lederman, spokesperson for Stop Toxic Incineration Springfield. Watch the stream of the entire panel discussion here. Over 20% of children in Springfield have asthma, which is more than double the statewide rate of childhood asthma, and 50% higher than the national average. This rate almost triples for African American and Latino children in Springfield.1 This is what environmental racism looks like. With over 500 known gas leaks in the city and a proposal to build a new toxic biomass incinerator, Springfield is heading in the wrong direction of fixing this asthma emergency, even though these organizations have been highlighting problems like this for years. Two years ago we marched to the Springfield City Hall and witnessed the unanimous vote to pass the Climate Action Resolution developed by the SCJC. The determined hope was palpable in the air of the courtroom. From the Springfield high school students who spoke about climate change, to the parents of children with asthma, and from religious leaders to community organizers, everyone had a pertinent story to share about why climate justice is the necessary path for Springfield. But now, over two years later, Mayor Domenic Sarno still has not implemented the Climate Action Plan that his government unanimously passed. The SCJC has increased their pressure by demanding a Climate Justice Plan, one that would employ Springfield residents to alleviate the city’s unemployment issues. “We don’t want a climate change plan. We want a climate justice plan,” Michaelann voiced on the panel. There’s a critical need for a framework of race and class politics when discussing sustainability and climate action. Without these frameworks, the constant push for renewable energy and electric vehicles from wealthy environmentalists becomes isolating and polarizing for those unable to afford such solutions. We are not going to buy ourselves out of climate change; our emotional and societal dependence on consumerism is part of the very problem that laid the groundwork for climate change. The changes we require come from collective action and dedicated grassroots organizing. We are not free until everyone is free. Climate Action Now is one of the co-founding organizations of the SCJC. Our work has also included organizing against the Kinder Morgan Northeast Energy Direct, a pipeline that would have carried gas obtained by hydraulic fracturing, or fracking, from Pennsylvania through New England. After a two-year-long grassroots movement, with a wide array of strategies, Kinder Morgan withdrew their pipeline application from the Federal Energy Regulatory Commission (FERC) and our struggle became a success. Not only does this gas leak into the atmosphere, rapidly accelerating climate change and increasing the risk of asthma and neurotoxin disorders, it also is an economic loss that falls on the backs of electric ratepayers in the city. Home Energy Efficiency Team estimated that in 2014 alone, this escaped gas accumulated to a loss of $2.3 million. Northampton is facing almost 100 known gas leaks, believed to be have cost ratepayers $600,000 in 2014. The SCJC is currently awaiting a response from a letter sent to Colombia Gas, the city’s electric utility company, requesting a meeting to discuss this issue. You can sign this petition to demand Colombia fix these leaks immediately. “Yes, fixing the leaks can be costly,” remarked Ivette Hernandez. “But we have a lot of people here looking for jobs,” echoing the interconnected justice aspect of the Climate Justice Plan. As City Councilor Adam Gomez aptly stated to close the panel, “creating real change in our community will begin with real unity.” In a world rapidly warming world with rising seas and increased pollution, hope can understandably be a difficult emotion to turn to. Our hope for a better world becomes more actualized when we come together and take collective action. Get involved with the Springfield Climate Justice Coalition! This meeting is open to all interested in being apart of the campaign to make Springfield a most just, sustainable, and healthy place for all. Whether you were apart of the founding of the coalition or you know little about climate change, all are welcome to learn about the work of this inspiring coalition. Dineen O’Rourke is a student at Hampshire College and an organizer with Climate Action Now. Follow her on Twitter: @dineenorourke. The Springfield Climate Justice Coalition is dedicated to ensuring that climate justice is the basis of every aspect of the city’s Climate Action and Resiliency Plan, from design and implementation to evaluation and modification. Climate justice begins with the recognition that low-income individuals and communities, people of color and indigenous people bear a disproportionate impact on their health and lives from environmental pollution and climate change. It ensures that a just transition creates economic and other opportunities for those who have been most affected by climate change. Climate justice acknowledges the debt owed to the community by those who have benefited economically from the burning of fossil fuels, and does not allow financial institutions and corporations to exercise undue influence on the climate change planning process. Because low-income people and people of color have relatively little power, their neighborhoods are more likely to be chosen for toxic dumping, extractive processes, refineries, factories and transportation infrastructure. They are more likely to live with air, water and soil pollution. Climate change places additional burdens on the poor, who do not have the financial resources to move away from rising waters, to install air conditioning to survive heat waves, to grow food on marginal lands, or to afford the rising price of food caused by droughts and floods. Our carbon-based economy must necessarily evolve to meet the challenge of climate change, providing Springfield with both the opportunity and the responsibility to place climate justice at the center of its climate change planning. With the rapid growth of solar and other renewable energy industries, and with growing support by the federal government for a “Green New Deal,” we have an opportunity to remake our communities with an eye to healing the economic divide, empowering those who have been powerless, strengthening our democracy, and creating a more just and sustainable society. A thoughtful, rapid, and responsible transition to a just, clean, and low-carbon economy will develop new jobs, create new community organizations, and integrate into our political and economic structure the people who until now have been marginalized and under-served. We offer the City of Springfield our time, energy and support as we work together to carry out these principles and reach these goals. 1. All decision-making processes that are undertaken by government and industry in regard to climate change must be open and transparent, and must be translated into the languages spoken by our city’s low-income, immigrant, and marginalized communities. 2. All decision-making processes that are undertaken in regard to climate change must include poor and indigenous people, people of color, and their legitimate representatives. Members and representatives of these communities must be directly involved in formulating the approach, issues, questions, and possible solutions, and participants should receive compensation for their work. In many instances interpreters will be necessary, and will be provided as part of the process. 3. The jobs that are created in the process of addressing climate change, which might include planning, surveying, communicating, installing renewable energy, installing insulation, sealing leaky pipes, shoring up dams, planting trees, building and driving new public transit including bike paths, will go preferentially to members of local environmental justice communities and their organizations. 4. The immediate co-benefits of climate change mitigation and adaptation will also be ensured for these communities. For example, these communities can have ready, affordable access to renewable energy and to insulation. Industries polluting their neighborhoods can be the first to be converted to non-polluting energy sources. Dikes can be built for low-lying neighborhoods and plans developed to ensure safe evacuation. Public transit can be expanded, and public support provided for community gardens and for food coops that sell locally grown sustainable food. Already-existing local businesses can be patronized; trees can be planted; green space can be created and protected from development; and solid waste reduction and recycling can be made more effective and convenient. 5. Fighting climate change means educating a new generation of students who can become experts in sustainability. Society will need specialists in every field – from engineering to biology, science writing to environmental ethics, solar installation to organic agriculture – who have the skills to help transform society. Resources for this purpose must be given to our region’s public schools. Culturally appropriate environmental studies, including opportunities for urban youth to connect with the land and to have hands-on learning outdoors in natural settings, must become a core component of our children’s education. Our local colleges and UMass/Amherst can and should recruit students from Climate Justice neighborhoods so that young people can help their communities to thrive. 6. Asthma, COPD, heart and vascular disease will be aggressively treated in the neighborhoods that have borne the brunt of air pollution. Adequate and affordable health care will be provided for all, including the undocumented. Springfield is rich in diversity and brings together the talents and cultures of many people. We can and must be leaders in our region. Together, we can prepare for climate change, reduce our city’s carbon footprint, and build a more just and sustainable community. Springfield’s air quality was given an “F” rating by the EPA and its effects are seen in the high rates of asthma and other respiratory illnesses that our residents suffer. This is one of many compelling reasons why Arise is reaching out to the community to continue to gather support for the implementation of our Climate Action Plan for Springfield; a plan that was unanimously approved by our City Council in October of 2014 after a spirited march, rally and speakout at City Hall. Building on over a year of grassroots organizing, Arise has sent out letters to over 150 organizations in Springfield, urging them to pursue the implementation of the Climate Action Plan by writing to Mayor Sarno asking that the city hire a full time Environmental Coordinator (EC). The EC’s job will be to ensure that the changes called for by the Climate Action Plan reflect the will of the community and happen in a timely manner. Serving as an agent for climate change mitigation, the EC’s job will include listening to and representing the community’s interests by advocating for changes in infrastructure and policies that will improve public health, encourage sustainable development, increase energy efficient and accessible public transportation and housing, access to healthy foods and ecological systems for waste management and empower the community through public education as part of the effort to combat climate change here in our city. We have made many new connections with community organizations and are growing our Climate Justice Coalition. SCJC and the Campaign for Non-Violence are organizing an Earth Week march and rally on April 19th to publicly show our Springfield elected representatives that our community is invested in implementing the climate plan. We have reached out to residents and begun a postcard campaign along with the letters to local organizations. Arise representatives engage local residents and personally explain the climate action plan, then ask if they would sign postcards to the Mayor and City Councilors to encourage the plan’s implementation. We have gathered hundreds of postcards in the weeks since the postcard campaign began! Click on this calendar to see a larger version. ” Last night I sat with a group of Springfield, Mass. residents who are acutely aware of the health impacts of climate change on their struggling city, and the particular burden that is carried by the poor. Across boundaries of race, class, and religious and ethnic background, this growing band of men and women is organizing to resist environmental injustice and to promote sustainability, resiliency and equality for all Springfield residents.” These words from the Rev. Margaret Bullitt-Jonas, are taken from her latest post here. The rapidly growing Springfield Climate Justice Coalition came together on 6/17, welcoming representatives from 17 organizations fully committed to working together to move Springfield forward as a resilient, sustainable, and equitable city! And more groups are joining every week, adding to our diverse and enthusiastic coalition of grassroots, institutional and faith-based membership. read more here Sarita Hudson of the Springfield-based Pioneer Valley Asthma Coalition gave a presentation on the health impacts of climate change, with a specific focus on the impacts being felt already by Springfield residents. We continue to organize around our call for the Mayor to fully fund a position for a lead person to create and implementing a Climate Action and Resiliency Plan for Springfield. A key part of this job will be to work closely with the community to ensure that those most vulnerable to and affected by climate change are directly involved. We agreed to redouble our efforts to move the City of Springfield, and especially the Mayor, forward, by continuing to engage ever greater numbers of the Springfield community in this grassroots fight for climate justice. On Monday, October 20, Climate Action NOW, Arise for Social Justice, the North End Organizing Network and our 27 other ally organizations in the 2014 Springfield Climate Justice March made history.With our dual-origin march from the Latino North End and Mason Square, we brought over 200 people together on the steps of City Hall for a rally as diverse in its age, ethnicity, race, religion and language as were its speakers. All were there to support the passage by the City Council of the Springfield Climate Action Plan, to mitigate global warming by cutting the city’s carbon emissions. The rally featured the newly-minted movement anthem “This Changes Everything” performed by songwriter Ben Grosscup, inspiration by Episcopal Bishop Doug Fisher, Mason Square Health Task Force leader Wanda Givens, and Michaelann Bewsee of Arise, and students and activists from throughout the City. Michaelann, Armando Perez of NEON, and Ernesto Cruz spoke of the need to see the resolution for a climate action plan being considered by the Council as the beginning of a process to clean the City’s air leading to lower asthma and emphysema rates, while providing jobs, lower electricity and heating costs, fresh food and safer communities, while at the same time stopping climate change on the local level. Armando Perez referred to the ideas for the climate change plan that had flowed from community organizing meetings: increased insulation, gardens, LED lights and solar panels for public housing; more recycling and composting to cut garbage burning; making industry cut its emissions and take responsibility for its pollution; providing usable sidewalks and bike paths particularly in areas like the North End polluted by traffic though their residents own fewer cars per capita than most New Englanders. These are some of the measures that the community will be calling for in our efforts to make the Springfield Climate Action Plan truly a Springfield Climate Justice Action Plan. The Raging Grannies ushered us into the building with song. In the foyer the group spontaneously began the civil rights theme song “We Shall Overcome” and continued it as we filed into chambers. There Dr. Doug Barnshaw of Arise, Sarita Hudson of Pioneer Valley Asthma Coalition and students from the Springfield Central High School Enviroteam exhorted the council to pass the resolution. Wilfredo Pastrana spoke through an interpreter about the need for serving public transportation needs of the city and Milta Franco read the Springfield Public Health Council’s resolution in support of the Climate Action Plan. Historic? As the City Councilors one by one declared the necessity of the Climate Action Plan and funding for an office to implement it, it was a major step forward by the second largest city in Massachusetts to recognize and combat the source of climate change. But historic also in the character of the coalition that produced it: African-American, white, Latino, young, old, upper and lower valley all brought together by common cause. Organizers admit the power of that coalition was crucial to the momentum to take this first step. All recognize, though, that this is only a first step. Mayor Sarno must approve funding for the creation of the plan and its administrator. Further, the plan must reflect the needs of those most affected by the city’s pollution who just happen to be the city’s poor and working poor. The historic coalition must gain strength in order to carry the task to fruition: a healthier Springfield with reduced carbon emissions. Marty Nathan MD, Climate Action NOW and Baystate Brightwood Health Center, both march sponsors. NORTHAMPTON — On a recent Wednesday afternoon I packed away my computer and told my Latina colleagues in our clinic in Springfield’s North End that I was off to take the bus home to Northampton. Though only one or two said it, their looks read equally, “You what?” — as if I was announcing plans to jump into the nearby Connecticut River. Many of them take the bus. They have to. They are paid near-minimum wage, many are single moms who can’t afford a car. And they live in Springfield, so the ride is not a trek. But I am a doctor. I drive my own car. Why would I make such a choice? One close friend nodded knowingly, “It’s for global warming, isn’t it?” “Yup,” I responded. Another said, “But you own a Prius!” “I know, but buses are better,” I said as I hurried away, knowing that I was going to have to jog as best as my 63-year-old legs could take me in order to make the next P21 Express to Holyoke, in order to catch the B48 to Northampton. They were left with not uncommon but friendly “Gringos are nuts” musings. I made it, but just. The bus had pulled out but the driver responded to my frantic wave. I find that drivers are extraordinarily generous and tolerant folks. In the interests of full disclosure, my dad was a Greyhound bus driver and I have always looked at transport workers as some of “my folks,” but it is a real pleasure to find men and women who go out of their way to help harried mothers of babies in carriages with toddlers in tow, elders who can’t speak English and folks like me who, after 24 years of education, repeatedly misread the schedule. I plopped down after frantically searching for and rendering exact change. I made my transfer in Holyoke and the trip was 50 minutes. Add on the two miles on foot and I have gotten my day’s exercise and made it from work in an hour and a half. It’s not as fast as driving. But I have begun to wonder whether speed is not a fair trade for cutting carbon, gaining community and eliminating the stress and isolation of driving. I did it for the first reason. We are destroying the planet by pumping carbon dioxide and methane into the atmosphere and heating and disrupting the climate and the oceans. The horrible drought in the western U.S. was front page news in the New York Times this month and our food supply is already being disrupted. I am going to admit, though, I figured that my taking the bus would be a sacrifice for my ideals. Hah. I am no martyr, nor need I be. I read, look at kids, talk to my fellow passengers, plan my evening and watch the Pioneer Valley go by as I leave the driving to someone else. I often muse on the community part. As Clare Higgins has written in her Gazette column, the Valley is a segregated place and we on the northern side of the “Tofu Curtain” have been cut off from the mainly poor, black, brown and non-English-speaking inner-city residents of Holyoke and Springfield. We whiz on past on I-91 and that’s as close as most of us get. My job means daily contact with poor and Latino men, women and children and I know what they tell me of their lives, I sometimes visit them, and I do my best to support and intervene for them. But it is a defined role. Being a pedestrian and a bus-rider is something of a leveler. I have found out just why my Springfield elders are afraid to go outside in the winter: the sidewalks are not cleared and I have more than once landed (fortunately) on my backside. Moreover I am likely to get run over when I try to cross the I-91 entrance from Route 20, despite the zebra lines designed to protect me. And the bus station is jammed and chaotic, without enough seats. It is not an easy thing to get around without a car in our cities. It needs to be made easier. Sidewalks need to be cleared as soon as streets.